​The celebrated recording of the Complete Beethoven String Quartets with the Quartetto di Cremona is now also available as an 8 SACD boxed set. This edition makes available all the composer's string quartets, alongside his String Quintet Op. 29 (the only original work by Beethoven with this scoring), in the highest quality. Ja, zo gaat dat. Het ene strijkkwartet begint aan een nieuwe Beethovencyclus (zie de aflevering van 15 augustus van deze rubriek) en het andere rondt er een af. Ook al heb je als kamermuziekliefhebber de Beethovenkwartetten reeds een paar keer compleet in de kast staan, 'Cremona' mag in geen enkele verzameling ontbreken. Het boxje staat garant voor dik negen uur genieten! In der Geschichte der wichtigsten Kammermusik-Gattung formen die Quartette Beethovens einen Gipfel, der, ähnlich der Sinfonien, singulär geblieben ist. Trittsicher hat ihn das Quartetto di Cremona bestiegen und dabei eine in allen Dimensionen perfekte Balance gefunden. I've been keeping an ear on Audite's complete Beethoven String Quartets series with the Quartetto di Cremona as they've been released since the recordings began in 2012, though I missed a few along the way. Now with this release of the complete quartets on 8 CDs I can take a long close look at the well-received series from this fine group, who hail from the city of the great stringed instrument-makers. These are elegant, controlled performances, though without the final burnished sheen of the Amadeus or Alban Berg Quartets. "Without minute neatness of execution," William Blake once said, "the sublime cannot exist! Grandeur of ideas is founded on precision of ideas." The "final minute neatness" is not here, or at least not all the time, though that neatness would in an case wear a bit thin through a full nine hours of music. The string quartets of Beethoven go on a meandering voyage through his own messy life, from his early days nearly to his death. This music, which began in the candle-lit salons of the Ancien Régime, emerges in the worlds of fashion and celebrity that made him a household name throughout Europe, and comes to an end in the squalor, regret and frustration of his final years. It's all too real to have the same Platonic existence of the music of Bach, though that doesn't make it any less grand, or sublime, in the Blakean sense. The Cremona musicians connect with this real-life Beethoven, his folk-song references, musical jokes and sentimental tags. And yet they're still able to bring a nearly full account of the soaring genius of the late quartets. Consider the Quartetto di Cremona a reliable guide to one of the greatest of all musical journeys. Het enige wat soms net nog lijkt te ontbreken zijn de rondspattende kanonskogels en het oorverdovende geweervuur. [...] Het zijn zomaar wat overwegingen die opborrelden tijdens de beluistering van deze set die indruk maakt, maar waarin bijna tomeloze ‘Sturm und Drang' en bij tijd en wijle zelfs anarchie (op. 18) de boventoon voert. Uitbundigheid overstijgt precisie (de hoekdelen van op. 59 nr. 1) en de intensiteit van dit spel doet de structuur menigmaal zelfs in zijn voegen kraken (op. 133). Kürzlich wurde der Zyklus mit Beethovens Streichquartetten vollendet, geehrt wird nun aber die vorletzte Einspielung der Gesamtaufnahme. The Quartetto di Cremona's ongoing Beethoven cycle has particularly impressed me for its visceral excitement and pulsating energy. Technical demands hold no terrors for this ensemble which dispatches the Fugal Finale to Op. 59 No. 3, taken here at breakneck speed, with dazzling clarity if not quite the elfin dexterity of the Takács Quartet on Decca. No less admirable is the seamless manner in which three of the instruments connect to a single line melodic sequence of semiquavers in the preceding Minuet. Another strength is their consummate mastery of soft mysterious playing, experienced here to best advantage in the unexpectedly veiled sounds they conjure up just before the recapitulation to the first movement of Op. 18 No. 2, or in the harmonically radical slow introduction to Op. 59 No. 3, where they manage to stretch tension and uncertainty to almost breaking point before the exuberant release of an unequivocal C major tonality in the ensuing Allegro vivace. Yet for all their undoubted qualities, these performances miss certain ingredients that are also central to Beethoven's musical make-up, in particular charm and humour. The outer movements of Op. 18 No. 2 are a good case in point. In the opening Allegro, for example, the Quartetto di Cremona convincingly projects the sudden explosive fortes, but the principal melodic lines seem somewhat devoid of grace and elegance. Likewise, for all its brilliance of execution, the performers underplay the sheer impudence with which Beethoven changes to distant keys in the skittish Finale. In general, therefore, the more expansive Op. 59 No. 3 is better suited to the Quartetto di Cremona's approach. Reviewers live with the frustration of how to convey music verbally, a frustration underscored by the Quartetto di Cremona. This is Vol. 7 of its complete Beethoven cycle, which has been greeted widely as intriguing and highly original. What sets these players apart comes down to an unusual quality: intellectuality. Every phrase in these two Beethoven quartets has been thrust under a mental microscope. Let me quote from a 2014 interview that violist Simone Gramaglia gave, where the question of vibrato comes up. The interviewer comments that in their account of the “Razumovsky” Quartet No. 2, the use of vibrato seems to be minimized. It was far from a simple topic to Gramaglia: “[Vibrato] is a matter of the performers’ taste but also of structure….In op. 59 no. 2 there are many sections in E minor that are very dark but not as dark as, for example, in the tonality of C minor. There are many extremes of violence, and it’s very important to bring brightness into the darkness.” Brightness is interpreted as calling for no vibrato in this case. Gramaglia goes on to talk about how expressivity doesn’t necessarily mean the use of vibrato; there is a wide range of bowing techniques as well as the contract point of the bow on the string that must be considered. The interviewer is intrigued by the PR blurb for the same recording, which says, “Beethoven’s musical language is no longer balanced and ‘well seasoned’ like that of his contemporaries but is extreme in every respect—ruthless and with feeling, dramatically operatic, and full of contrapuntal finesse.” It’s very promising that so much analytical attention is being applied to middle-period Beethoven (I’ve barely skimmed the surface of the interview), and the resulting performance on this new recording of the “Razumovsky” Quartet No. 3 is original to the point of being peculiar. As much ingenuity is applied to the details of sonority as if we were hearing one of Bartók’s later quartets. In fact, I’ve never encountered Beethoven played in such a piercing, at times existential, hollow, despairing, and alienated manner. Delivering a moment of charm is almost a betrayal of the ethos the Quartetto di Cremona wants to convey. Typically, a group that plays the drawn-out chords of the Introduzione without vibrato would be making a period performance gesture. Here, however, the effect is stark, a slash-and-burn that is unabashed. But then what to do when the main Allegro vivace, with its boisterous major-key exuberance, contradicts the opening? The same dilemma arises in the second movement, where a certain poised lightness is implied by the marking Andante con moto quasi allegretto. The Cremona rocks back and forth with a questioning pulse that’s neurotically moody. Once again it’s very effective, but the gentle strain that comes up in the violins isn’t remotely this eerie as Beethoven scores it. One can point to many imaginative details—they crop up in practically every measure—and after a certain point the listener must either give in or rebel. I find myself strongly on the side of giving in and appreciating with fascination how a familiar work is suddenly made to sound new. The Cremonas have made the point in print that Beethoven’s mature quartets are highly intellectual and deserve this kind of intense scrutiny. The scherzo creeps in on cat’s paws and really does remind me of the lopsided Hungarian dance rhythms of Bartók. The most divisive movement is the finale, where the marking of Allegro molto is injected here with amphetamines, turning into a manic Presto that to me sounds breathless. In all fairness, however, the 5:46 timing isn’t radically faster than the Alban Berg Quartet’s 6:01 from that ensemble’s first Beethoven cycle (EMI/Warner). The second quartet from the op. 18 set fulfills Monty Python’s “and now for something completely different.” The Hamlet-like mood of the Cremonas’ “Razumovsky” performance is discarded in favor of comic relief. Using a bright tone made brighter without vibrato, they take the first movement and extend its Haydnesque animation into Beethoven’s unbuttoned brio. The four members of the Quartetto di Cremona—Cristiano Gualco and Paolo Andreoli, violins, Simone Gramaglia, viola, and Giovanni Scaglione, cello—are carefree and confident no matter how fast the passagework is. Every movement of their op. 18/2 wears a smile, and the performance exults in its own playfulness. The ensemble’s tone changes in weight and color quite impressively to match the moment, although the general tendency is toward a contemporary lightness and even edginess. In all, this is a disc that makes me want to hear all of the Cremonas’ Beethoven to date. In the Fanfare Archive I found only one review so far, Jerry Dubins’s of Vol. 2 from 2014, which pairs the Second “Razumovsky” with op. 127. He seconds my opinion that this is a group to get excited about. Bright, lifelike sound from Audite adds to the immediacy of the performances. Beethoven als Lebensbegleiter scheint das Motto des ‘Quartetto di Cremona’ zu sein. Ergänzend zu den fulminanten und feurigen Aufnahmen der Streichquartette, spielen die italienischen Musiker den gesamten Zyklus wiederholt in Konzertreihen. Fast hat man den Eindruck, dass die Beethovenschen Quartette zu einer Art Droge geworden sind, eine Musik, die die Cremoneser nicht mehr loslässt. Gerade diesen fesselnden Zustand übertragen sie auch auf ihre Zuhörer. Man sitzt gespannt vor der Stereo-Anlage und lässt sich von jeder Note, von jeder Artikulation, von jedem Zwischenton mitreißen. Das galt für die bisherigen sechs CDs dieser großartigen Referenz-Einspielung, das gilt auch für die neueste Produktion mit den Quartetten op. 18/2 und op. 59/3. Dass diese Gesamteinspielung Referenzcharakter haben würde, war sehr früh abzusehen. Es zeugt von höchster Musikalität, von höchstem musikalischen Einvernehmen, wenn man als Quartett über einen derart langen Zeitraum die gleiche Spannung, die gleiche Intensität, die gleiche Frische des Musizierens aufrechterhalten kann. Auch diesmal steht ein frühes Werk einer reiferen Komposition gegenüber. Das Quartett in G-Dur klingt frisch, wie eine leichte Brise, kraftvoll, spritzig in den schnellen Sätzen, verinnerlicht im Adagio. Das spätere, dritte ‘Rasumowski-Quartett’ ist in seiner Anlage reifer und kühner. Einmal mehr lässt sich das ‘Quartetto di Cremona’ von dieser Kühnheit Beethovens nicht einschüchtern. Es pariert sie mit forschem Impetus, intensiver Spannung und kammermusikalischer Virtuosität, wie sie selten zu hören ist. Excitingly intense and deeply musical performances of Beethoven’s Quartets op. 18/2 and 59/3. www.pizzicato.lu | 24/02/2017 | Uwe Krusch | February 24, 2017 Was für ein Zyklus! Eigentlich reicht der Satz: Es geht weiter wie bisher. Die Reihe der Einspielungen der Beethoven-Quartette wird mit zwei Quartetten aus den beiden Zyklen op. 18, nämlich der Nummer 2 in G-Dur und dem dritten in C-Dur aus op. 59 durch das ‘Quartetto di Cremona’ fortgesetzt. Wiederum wird die überwältigende Behandlung der Musik deutlich. Hier haben nicht die Quartettmusiker ihren Meister gefunden, sondern sie sind die Meister der Musik. Ins Ohr fällt sofort der leichtere Ansatz, den man wohl mit italienischer Leichtigkeit bezeichnen könnte. Damit gelingt es den Cremonensern, den Werken eine Brillanz und Frische mitzugeben, die manch anderer Interpretation fehlt, möglicherweise, weil sich da der hinterhermarschierende Riese im Hinterkopf festgesetzt hat. So erreichen die vier beispielsweise im Finalsatz des dritten Rasumovsky Quartetts eine schlicht umwerfende Rasanz, die aber den Eindruck spielerischer Leichtigkeit geradezu noch steigert, da das Spiel zwar umwerfend schnell klingt, gleichzeitig aber entspannt. Es bleibt der Eindruck, dass da Reserven vorhanden wären, während andere hier doch hechelnd ins Ziel kommen. Two more of Beethoven’s string quartets provide decisive proof of Quartetto di Cremona’s overwhelming technical capacity and fantastic musicianship. Das Quartetto die Cremona ist mittlerweile längst kein Geheimtipp mehr. I get to review Beethoven quartets almost every issue. As much as I lament the fact that great ensembles too seldom record unfamiliar or contemporary repertoire, I almost always find these releases a treat. Each new reading, even if it’s mediocre, reveals new possibilities. The Cremona Quartet has never disappointed me. 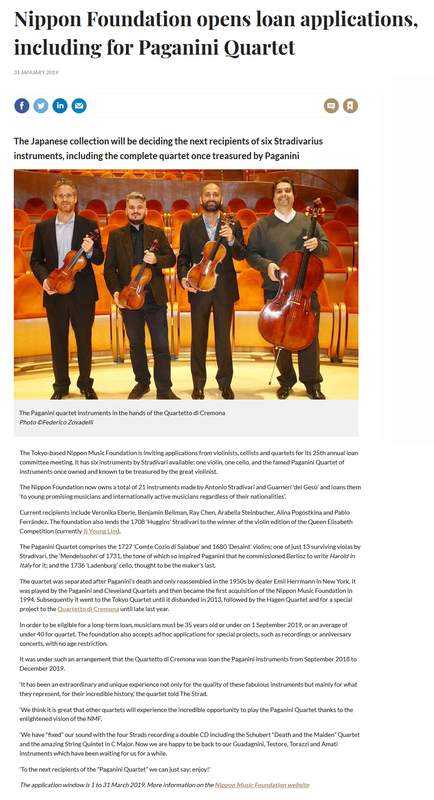 I reviewed their release of Quartets 6, 11, and 16 (Sept/Oct 2013). I thought it was very good, and this one is even better. Their approach to Beethoven seems to be expressive, but straightforward and never overplayed. Most of my recordings of Op. 18 are either too delicate or too romantic, but Cremona comes pretty close to the bull’s eye. Their interpretation is crisp, yet robust. 1:I is a little quicker here than on any of my other recordings, but the tempo gives it a lilt that I don’t think I’ve heard elsewhere. I also enjoy their reading of Quartet 14. Here, too, they play in a way that is very direct, but not dry. The tempos are again quick, and listeners might miss the weariness often heard in late Beethoven. For that, go with the Italiano, whose slow movements in particular are praised in our overview of the Beethoven Quartets (Nov/Dec 2006). If you’re looking for clarity, though, the Cremona would be hard to beat. They allow the work to unfold slowly and naturally, without any interpretive excess. The Elias Quartet’s approach to Beethoven is the opposite of the Cremona’s. They are too romantic. In Quartet 4 many details are exaggerated, and the music feels quite bogged down. Accents are overdone, and there are many unnecessary pauses. Also, there is a lot of sliding and scooping. There is even more of this in Quartet 13. In general, they simply seem to be pushing too hard. This way of playing might work for Brahms. I’d like to hear this group play something else, because they are creative and technically skilled and have a rich sound. But I cannot recommend this. Here's some tremendously accomplished playing in two works from opposite ends of Beethoven's career as a composer of string quartets. The scurrying triplets in the finale of the first of the Op. 18 quartets, for instance, are articulated with remarkable clarity, and the tricky violin writing in the trio of the same work's scherzo is dispatched with admirable fluency. At the other end of the scale, in the long variation movement that forms the expressive heart of the late C sharp minor Quartet Op. 131, the individual phrases of the initial theme are handed over from one violin to the other with admirable tenderness, and the players find just the right caressing tone for the third variation, which Beethoven wanted performed lusinghiero ('flatteringly'). There are moments when the players' approach to the music can seem a little larger than life: the sforzato accents in the central section of the slow movement of Op. 18 No. I – one of the great tragic utterances among Beethoven's earlier works – sound like pistol shots; and the same marking in the subject of the slow opening fugue of Op. 131 is again exaggerated, disrupting the music's tranquil mood to an unnecessary degree. If these are faults, however, they are faults in the right direction. Curiously enough, given the players' propensity for dramatisation, Op. 131's second movement sounds rather easygoing for its 'Allegro molto vivace' marking. But these are compelling accounts, and this fourth volume in the Quartetto di Cremona's Beethoven cycle can confidently be recommended. Die frühen Beethoven-Quartette wirken in manchen Aufnahmen – gerade im Vergleich mit den mittleren und späten Werken – noch ein bisschen brav. Nicht so beim Quartetto di Cremona. Die Streicher aus der Welthauptstadt des Geigenbaus gehen im Quartett op. 18,1 mit einem (typisch italienischen?) Temperament zur Sache, das den Hörer unmittelbar packt. Umwerfend, wie sich die Vier im eröffnenden Allegro gegenseitig befeuern. Im Gesang des anschließenden Adagio sind dann die Leidenschaft und Ergriffenheit, die Beethoven mit der Vortragsbezeichnung „affettuoso ed appassionato“ einfordert, so deutlich zu spüren wie in nur wenigen Einspielungen. Das 26 Jahre später entstandene cis-Moll-Quartett op. 131 kommt aus einer ganz anderen Sphäre. Hier hat Beethoven die Formen der klassischen Tradition längst hinter sich gelassen und eine Tonsprache geschaffen, die bis heute nichts von ihrer eigenwilligen, mitunter widerborstigen Rätselkraft verloren hat. Viele Musikhistoriker und Interpreten haben immer wieder den vermeintlich abstrakten und weltabgewandten Charakter des Spätwerks hervorgehoben. Das Quartetto di Cremona rückt die Musik dagegen in ein sehr menschliches Licht. Auch im cis-Moll-Quartett steht der Ausdruck für die vier Italiener im Vordergrund. Das zeigen sie etwa mit ihrer expressiven Wärme, die den eröffnenden Fugensatz ebenso beseelt wie die Variationenfolge im zentralen Andante, aber auch mit der Leidenschaft, die das ganze Finale vorantreibt wie in einem Höllenritt. Auch ein Komponist, der sein Gehör verloren hat, bleibt ein Mensch aus Fleisch und Blut: So lautet die zentrale und überzeugende Botschaft des Cremoneser Ensembles zu Beethoven, die in der vierten Folge der Gesamtaufnahme besonders deutlich zutage tritt und auch klangtechnisch, wie gewohnt, sehr klar übermittelt wird. Die frühen Beethoven-Quartette wirken in manchen Aufnahmen – gerade im Vergleich mit den mittleren und späten Werken – noch ein bisschen brav. Audite’s recording is close if not claustrophobic, close enough to differentiate the character of the four Italian instruments as well as their players—the 20th-century viola and cello are more reticent if more timbrally even than the Amati and Testore instruments used by the violinists. The microphones catch both the leader’s sniff and the rather wide and slow vibrato he uses in general; I prefer the pure tone employed by him and his colleagues to chilling effect in the Adagio of Op 18 No 1, which is invested with an unusual depth of expression. The dramatic silences are given full measure around Eroica-like intensifications of the main theme’s second half at the movement’s climax, and the players don’t let the tension slacken with a sentimental rallentando but bend the coda with discreet portamento. Right from the subtle play with Beethoven’s opening gambit—first tentative, then more assured, like a guest at the door putting their party face on—this is a performance that moves with purpose and takes care over the small things. Both the Scherzo and its Trio push on relentlessly—it’s a small room for a busy party and the guests are inclined to talk to your face—with plenty of buzz from the cellist as he lays into a point. The confrontational tonal profile of the quartet is more obviously suited to the abrupt contrasts of Op 131. The stabbing accents of the opening Adagio would cut deeper at a lower dynamic level, and throughout there is a lack of really quiet, inward playing, even in the central Andante. Accordingly the finale is a first cousin to the Grosse Fuge, raw and impressively provisional. Der mögliche Einbruch bleibt aus. Das ‘Quartetto di Cremona’ hat den langen Atem, weicht nicht von seiner kompromisslosen, aufwühlenden, packenden Lektüre der Beethoven-Quartette ab. Diesmal haben die vier Musiker das frühe F-Dur-Quartett und das späte cis-Moll-Quartett miteinander konfrontiert. Die zeitliche, vor allem aber die künstlerische Distanz zwischen Opus 18 und Opus 131 ist nicht zu überhören. Dennoch bleibt ihnen eines gemein: die Beethovensche Unrast, die fiebrige Romantik, die emotionale Unwucht. In Opus 18 mag das wohl noch etwas klassisch ummantelt sein. Vor allem der lyrische 2. Satz enthält manche Reminiszenzen an Haydn. Aber auch da setzt das ‘Quartetto di Cremona’ immer wieder Ausrufezeichen, bricht aus dem wiegenden, wohlgeformten Duktus aus – wie ein Ausbruch aus einem wohlbehüteten Leben, ein Aufbruch zu neuen Ufern. Das Spiel der Cremoneser bleibt immer griffig, zupackend – auch im leichtfüßig und transparent vorgetragenen Schlussallegro. Opus 131 unterscheidet sich vom Frühwerk schon allein durch die reifere Anlage, durch Beethovens tiefes Durchdringen musikalischer Gedanken, mit denen die Interpreten vollauf im Einklang sind. Dem brillanten Klang im Andante stellen sie in den schnellen Ecksätzen ein vulkanisches Aufbäumen entgegen, ein emotionales Beben, bei dem sich die tiefen Streicher im 7. Satz an einem seelischen Abgrund bewegen. Dem Sog dieser Interpretationen kann man sich kaum entziehen. Restlessness, feverish romanticism and emotional force characterize the Beethoven performances by Quartetto di Cremona. The four Italians are deeply penetrating the composer’s musical thoughts and several times kind of an emotional quake brings the music into ebullition. El cuarto volumen de los cuartetos de Beethoven por el Quartetto di Cremona pone en diálogo dos obras muy contrastadas: un cuarteto temprano y otro tardío del maestro de Bonn cuya distancia en el tiempo – 27 años median entre uno y otro – refleja no sólo el drástico cambio de estilo que experimentó el lenguaje beethoveniano como producto de una renovación consciente de los procedimientos tradicionales, sino también la diferencia entre las lógicas exigencias técnicas que los demarcan. If there are problems with maturity, they don’t show up in Quartet 4, an enthusiastic, dramatic affair from early in Beethoven’s career. The playing is sharply articulate, enthusiastic, and somewhat Haydnesque—in other words, a fine, outgoing, “young” performance. Some of my characterization of the playing comes from the sonics, which are bright and leave violinist Cristiano Gualco sounding a bit wiry; put another way, the CD hasn’t very much warmth, so this doesn’t sound like a burnished German group. Quartet 7 (Razoumovsky 1) is nicely done—standard tempos with fine control of the many exposed places. I was particularly pleased that when called for, their playing can be very quiet. Many groups glide over Beethoven’s dynamics and sforzandos, but the Cremona observes them well, bringing interest to the piece without calling undue attention. As for Quartet 16, the Grosse Fuge, I’m never sure what to say. The piece seems to be overwhelming in its intellect and emotion, but I’m not certain I “get it”. At any rate the Cremona, like most quartets, slash and burn their way through the piece. In sum I have a better impression of the Cremona in this installment, even if I wouldn’t place them with the Quartetto Italiano quite yet. The bright sound is a small impediment for me, but on different equipment with surround sound it might be perfectly fine. Zunächst ist man sprachlos, aufgewühlt, wenn die letzten Töne dieser Einspielung verklungen sind. Erst allmählich wird man sich dann bewusst, welchen Strudel an Emotionen man einmal mehr mit dem ‘Quartetto di Cremona’ durchlebt hat – insbesondere in der großen Fuge op. 133, die wir bislang noch nie in einer derart berauschenden, zum Teil erschütternden Interpretation gehört haben. Hier wird Beethovens Modernität, sein Sprengen aller musikalischer Grenzen, wahrhaft Klang. Die vier italienischen Musiker eröffnen ganz neue Hörweisen, präsentieren einen uns eigentlich bis dato unbekannten Beethoven. Auch sie gehen in ihren Ausdrucksmöglichkeiten an die Grenzen, bleiben nach wie vor kompromisslos in ihrer messerscharfen Deutung – sowohl in dem frühen Werk aus Opus 18, als auch im Rasumowsky-Quartett und erst recht in einem der Höhepunkte kammermusikalischen Schaffens: der Großen Fuge. The Quartetto di Cremona digs deep into Beethoven’s music, thus revealing a whirl of emotions like we never experienced in this music. Early, middle and late Beethoven is projected with visceral excitement and pulsating energy by this gifted quartet. Occasionally I missed a more lyrical approach, especially in Op. 59 No. 1. Viel schroffer dagegen die Kontraste in der "Großen Fuge", die vom vibratolosen Flüstern bis zu explosiven Attacken eine gewaltige Spanne aufreißt. Hier geht das Ensemble immer wieder an die Grenzen des traditionellen Schönklangs – ganz im Sinne von Beethovens vielleicht verstörendstem Spätwerk, in dem die Extreme auf die Spitze getrieben sind. Auch dort finden die Italiener die richtige Mischung aus Kontrolle und Hingabe – und fördern die existenzielle Dringlichkeit der Musik zutage. Each volume of this evolving Beethoven quartet cycle from the Quartetto di Cremona usefully encompasses works from all three creative phases of the composer's life. Nowhere else in his oeuvre, save perhaps in the piano sonatas, can the listener experience at first hand Beethoven's novel technical and expressive advances being brought into such sharp relief across a range of works in a Single genre. With this new SACD release, Volume in Audite's series , that creative evolution and attendant polarization of form and ideas seems even more startling than before. The reason for this is no t hard to determine; the programme combines the tersely belligerent C minor Quartet from the Op. 18 group with the Grosse Fuge and the first of the middle period 'Razumovsky' Quartets, Op. 59. It would be hard to cherry-pick a more challenging or more representative group from among Beethoven's quartets, making this compilation particularly appealing, one imagines, to anybody for whom these works might still be terra incognita. However, so far, this series has had mixed fortunes. Variable performances from the Cremona Quartet haven't always lived up to the expectations their heritage seems to have conferred upon them, as perceived successors to the illustrious Quartetto ltaliano. Consequently in an already oversubscribed field, these accounts probably won't be the ones most of us would choose to live with, despite much that's entirely praiseworthy: the highlight here is an ardent account of Op. 59 No. 1 that seems to me to be the finest individual performance I've heard so far in the Cremona Quartet's cycle. The C minor Quartet, Op. 18 No. 4, owes much to the minor-key works of Haydn, in particular to the second in the Op. 76 set, the D minor Quartet popularly known as the 'Fifths'. Speeds are invigorating; and with bristling attack and mercurial Mediterranean passions simmering away, this was always going to be an exciting account! Yet there are moments which don't quite come off, particularly in the Andante, and the tiered dynamics and syncopated abruptness of the Menuetto find these players in less than full accord, though the finale goes very well indeed. In the Grosse Fuge climaxes are reached too soon, motorically and expressively, and amid this torrential onrush, the team begins to flag well before the music has run its course. This proved a considerable disappointment, particularly when compared to the superlative account from the Belcea Quartet, whose visionary playing of all these works has raised the bar in the interpretation of the Beethoven string quartets by several notches in the recent past. Finally things begin to go well, however, and the Quartetto di Cremona ends Volume 3 of its Beethoven cycle in fine style, with a thoroughly assured performance of the first 'Razumovsky' Quartet. If the playing cannot match the overall tonal cohesion of the Belceas, this is a solidly reliable reading nonetheless, which ticks most, though not quite all, of the right boxes. The biggest problem you'll detect at the outset is the somewhat anonymous character of the playing. Certainly the opening movement goes well for the most part, though the cello's introduction of the 'Eroica'-like first subject seems to lack something in presence and character, whereas the Belceas sound altogether more intrepid and purposeful. The Cremonas need time really to find their feet here, but when they do, there's crisply alert ensemble playing and a genuinely convincing sense of teamwork which hasn't always been so much in evidence previously. The pointed Scherzo hasn't quite the metrical rigour of the Belceas' version, and dynamics are not so strongly attenuated, but this impression may well derive from the recording, made in a fairly reverberant auditorium, than to any particular shortcomings in the playing itself. The slow movement brings moments of heart-rending expressivity, however, and these players are at their impressive best when they allow the music to unfold at its own natural pace; the transition into the Russian•inspired finale, one of the most dangerous and unpredictable passages in Op. 59 No. 1, is nicely managed too. Audite's production is never sonically the equal of Zig-Zag's exceptional Belcca Quartet recordings, but the sound is bright and well balanced. With Michael Struck-Schloen's informative booklet notes to hand, this is much the best disc in this series to date. Classical CD Choice | August 13, 2014 | Barry Forshaw | August 13, 2014 From Strauss to Superman: New titles from PentaTone, Silva Screen, etc. I got my first taste of the Quartetto di Cremona in a survey of Beethoven chamber music last summer. Now they've reached Vol 3 of the quartets and the qualities that were apparent then are just as abundant here, I particularly like the way they combine early, middle and Iate Beethoven: it sets up fascinating tensions and counterpoints. Their opening of the Grosse Fuge is a reminder that this is one of the greatest of all gauntlet- throwing-down gestures in music. It's immensely ballsy playing, sweaty, almost anarchic in the sense of it almost coming apart at the seams in the AIIegro proper. This is emphasised by Audite's immediate recording (the Lindsays sound deliberate by comparison). Many others are more polished - not least the Takács, while the Talich have a wonderful clarity - but this is a thrilling ride, even if timbre suffers at times. The extraordinary opening of Op 59 No I needs, to my mind, to begin almost midstream: the Talcics are spot-on, and their mix of elegance, energy and precision is very alluring. The Quartetto di Cremona are that bit more impatient: it's no surprise that this spacious movement is highly emotive, tremulous even. The Artemis tread a convincing middle ground, while the Takács, who seem almost frozen with grief at the outset, create one of the most intense readings of all. The Cremona's finale, though, is wonderfully energetic, the players ripping into the accents with real glee. If you're a fun of the recent Belcea account of Op 18 No 4, chances are you won't much like this. The pent-up emotion that characterises that account has no place here, particularly in the sliding, slewing Minuet, which is energetic and humorous; the very focused finale of the Belcea strikes me as a little po-faced; the Hagen, with a not dissimilar approach, find more light and shade; but the Cremona's appeal lies in their reactivity and playfulness. Performances of great personality, then; not benchmarks but an exciting addition to the shelves nonetheless. Spiegel online | Sonntag, 25.05.2014 | Werner Theurich | May 25, 2014 Feine Kammermusik: Einmal Feuer für Herrn Beethoven, bitte! Feine Kammermusik: Einmal Feuer für Herrn Beethoven, bitte! From Strauss to Superman: New titles from PentaTone, Silva Screen, etc.